Kerosene for lamps will replace the medicinal “Seneca Oil” product from an historic Pennsylvania oil seep. The stage was set in 1854 for the start of America’s petroleum industry when a lumber company sold 105 acres along a creek with oil seeps. On November 10, the lumber firm Brewer, Watson & Company sold a parcel of land at the junction of the east and west branches of Oil Creek southeast of Titusville, Pennsylvania. The buyers were George Bissell and Jonathan Eveleth. In the summer of 1921, the Signal Hill oil discovery would help make California the source of one-quarter of the world’s entire oil output. Soon known as “Porcupine Hill,” the town’s Long Beach oilfield south of Los Angeles was producing almost 260,000 barrels of oil every day by 1923. 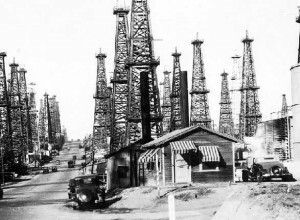 Signal Hill, a growing residential area prior to the 1921 discovery of the Long Beach oilfield, would have so many derricks people would call it Porcupine Hill. “Today you can see wonderful commemorative art displays of this era throughout the lush parks and walkways of Signal Hill,” notes a local newspaper. 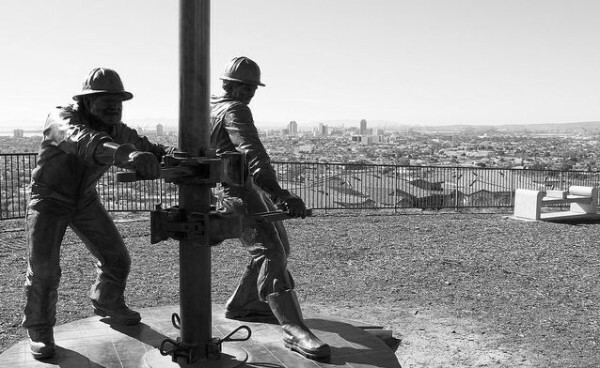 At 2300 Skyline Drive atop Signal Hill, California, two bronze roughnecks commemorate the men who brought petroleum wealth to the state following a 1921 oilfield discovery. “Tribute to the Roughnecks” by Cindy Jackson stands atop Signal Hill. Long Beach is in the distance. Signal Hill circa 1930 – at the corner of 1st Street and Belmont Street. Photo courtesy of the Seaver Center for Western History Research, Los Angeles Museum of Natural History. The Alamitos No. 1 well erupted “black gold” in June 1921, announcing discovery of California’s prolific Long Beach field. The natural gas pressure is so great the oil gusher climbed 114 feet into the air. The well produced almost 600 barrels a day when completed on June 25. It will eventually produce 700,000 barrels. California’s major petroleum fields are included in this 2010 U.S. Geological Survey map. Natural seeps dominate the coastline. A 1969 oil spill from a California offshore platform transformed the public’s view of the American petroleum industry and helped launch the modern environmental movement and the Environmental Protection Agency. Natural California seeps leak thousands of tons of petroleum every day – and have for several hundred thousand years. On January 28, 1969, after drilling 3,500 below the ocean floor, a Union Oil Company drilling platform six miles off Santa Barbara, suffered a blowout. Between 80,000 barrels and 100,000 barrels of oil flowed into the Pacific Ocean and onto beaches, including Summerland – where the U.S. offshore industry began in 1896 with wells drilled from piers. 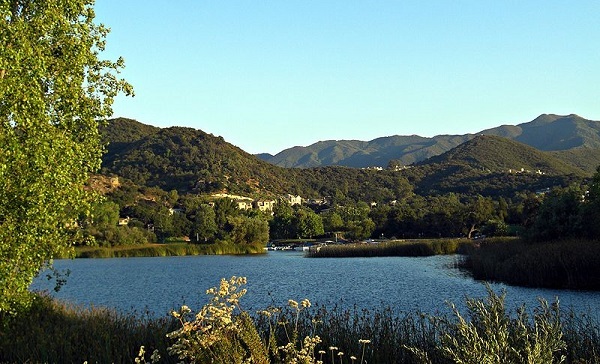 Twelve miles inland of the Pacific Ocean in the Conejo Valley, Thousand Oaks, California, has more than 125,000 residents “nestled neatly within a picturesque plateau, rimmed by scenic hills, mountains and trees,” notes a local realtor. Conejo Hills Oil Company’s history is the story of a single California well, spudded by one company and drilled for years by many others in what today is a residential neighborhood of Thousand Oaks, one the wealthiest cities in America.